Project management is very integrated & connected. An action or failure to take action in one area usually affects other areas. The interactions may be straightforward and well-understood, or they may be subtle and uncertain. For example, a change in scope may also impact time and cost. These interactions often require trade-offs among project objectives, performance in one area may be maintained only by sacrificing performance in another. Successful project management requires actively managing these interactions and trade-offs all at the same time (you rarely get a project that does not have things overlapping). To help in understanding the integrative nature of project management, projects can be organized into Process Groups. The Process Groups can also be thought of as phases or stages or simply, a set of related processes grouped together that help guide what tools and techniques can be appropriately applied at the given stage of the project. The Process Groups can occur multiple times within a project life cycle. Each project phase could have several variations of the process groups. Reminder: The project management process groups are not discrete, one-time events; they are overlapping activities which occur at varying levels of intensity throughout each phase of the project. The more advanced you become as a PM, the more you will overlap all processes (good to start with sequential workflow plans such as: A - B - C - D) but as you are more confident, then the true fun begins when you start to manage multiple processes that are overlapping and not following the text-book sequence that they were planned to follow (e.g. A - B - D - C - E and at the same time many other work flows that are managed simultaneously.... such as A - B - C, and G - I - J - H - K , etc). Also note that extra challenges come when you manage intangible related projects (vs tangible/concrete). Since the abstract, uncertain, innovative and intangible projects require constant scenario based planning and re-planning and by far are the most difficult, mature types a company or person can take on. Initiating – consists of the processes that define a new project or project phase by obtaining formal authorization. Planning – consists of the processes that establish total scope, refine objectives and develop course of action required to attain the objectives and scope that the project was undertaken to address. Executing – consists of the processes that integrate people and other resources to complete the work defined in the project management plan of the project. 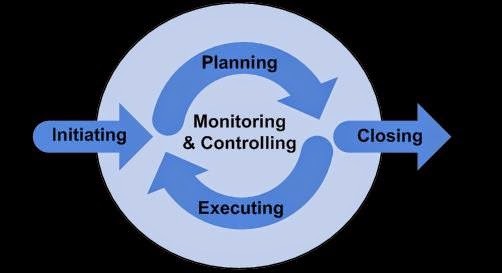 Monitoring and Controlling – consists of the processes that track, review and orchestrate the project progress & performance, identify any areas of change to the plan that could be required and initiate the changes. Closing – consists of the processes that conclude all activities and will formally complete the project. This includes formal acceptance of the product or service to end the project.